The world of industrial activated carbon may seem completely unrelated to a small farm in the bucolic setting of rural New York state, but Cornelius & Patricia du Plessis have made this connection in a way that they hope will bring benefits to society, abundance to their Rainbow’s End Farm, and profits for their small company. Their philosophy can be summed up by the quote on their website from American ecologist Aldo Leopold: “There are two spiritual dangers in not owning a farm. One is the danger of supposing that breakfast comes from the grocery and the other that heat comes from the furnace”. Cornelius du Plessis came to biochar with 30 years experience in industrial engineering and activated carbon. He holds eight US patents in the process and technology of converting agricultural biomass residues into activated carbon and charcoal, and has worked internationally in Africa, South America and Mexico. Today he is applying his knowledge of carbon properties and thermo-chemical conversion processes to the development of clean biochar technologies for use on the farm. During his activated carbon career, du Plessis had many opportunities to observe dirty, inefficient traditional charcoal kilns in operation. He has made it his goal to design biochar production technologies that are not only clean and efficient but also able to harness the waste heat energy and put it to use. du Plessis has two units operating on Rainbow’s End Farm that produce biochar and heat energy in a continuous feed system that can utilize residues like wood chips, coconut shell, grass pellets, palm oil kernels, peach pits and macadamia shells. One of the units at Rainbow’s End Farm supplies 500,000 BTU per hour of heat energy for a cottage, workshop and greenhouses. 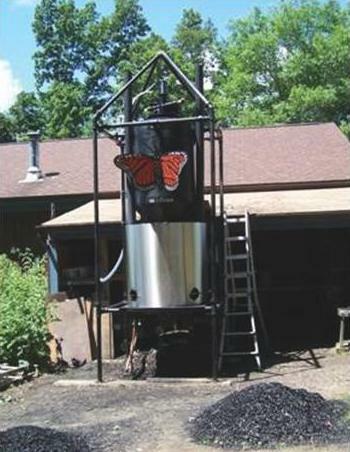 In one 24-hour cycle the unit processes 2500 pounds of wood chips and produces 800 pounds of biochar. The du Plessis family has many ongoing experiments using biochar in the greenhouse nursery. They have developed an innovative 3-bin biochar worm composting system and a biochar lawn applicator that applies biochar and compost tea as it aerates the soil. You can visit their website to see pictures of these offerings as well as the two biochar production units operating at the farm.